Dry, rugged mountains barely separate Southern California’s eastern Imperial County from Mexico along the Interstate 8 en route east to Arizona. It is barren. Occasionally, a desperate individual will cross those mountains despite the adverse nature of the landscape and the existence of a pseudo-military; the American Customs and Border Patrol and Immigration and Customs Enforcement (ICE). Politics aside, this region makes up one of the largest deserts in the world. From the Mojave to the Sonora and the Saguaro, this area is expansive. It is also filled with people. San Diego and Los Angeles, Phoenix, Las Vegas. But there never was supposed to be a civilization out here, at least according to Marc Reisner, author of one of the most definitive historical studies of human civilization in the “arid West,” Cadillac Desert. The artificiality of places like Palm Springs, Las Vegas, Phoenix seems like an affront to the desert. It doesn’t take a hydrologist to realize that there simply is not enough water around the American West and Southwest to sustain these massive, urban zones that are still landscaping like it is the 1950s on skyrocketing scales. White picket fence, grass lawn. Fountains. Unsustainable. But in the West, the clash between civilization and nature is marked by beautiful wildernesses, cordoned off from the processes of modification necessary to create an environment hospitable to large-scale human life. These areas are wild desert islands and attract a particular type of desert pilgrim. In Arizona, the icon of the desert is the saguaro. 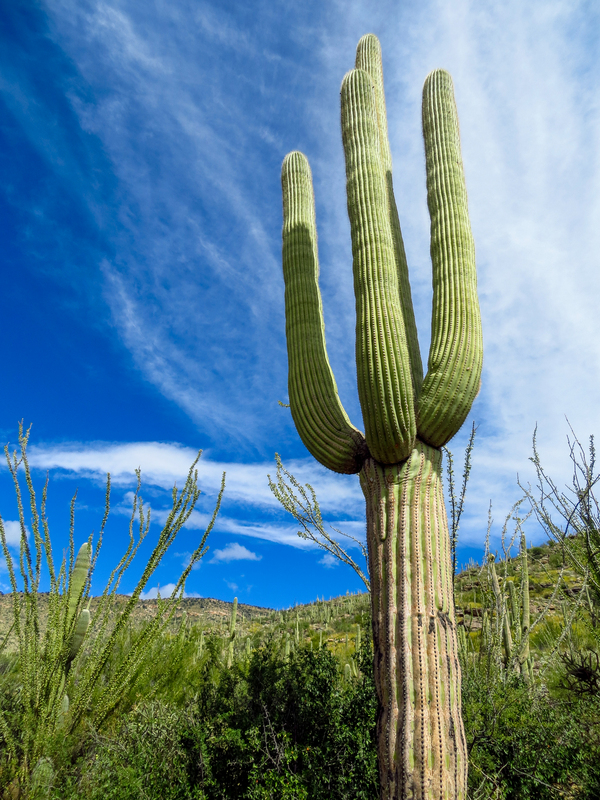 A saguaro cactus can grow to be up to be between 150 and 200 years old. At the youngest, that’s about thirty years older than the oldest oldest human who ever lived. Their tall, spikey arms reach upwards making homes for birds and homage to the sky. Located right next to the city of Tucson, Saguaro National Park is filled with them. It is also teeming with life. A common misconception of the desert is that it is totally arid and inhospitable, but it exists as a rich, diverse, ecological zone. To walk amidst the cactus and stumble upon a tiny stream or puddle is a remarkable thing. It is beautiful. Saguaro Cactus, Saguaro National Park, Arizona. Photo by AP. Deserts exist all over the world, as do people. Our relationship to the landscape, particularly to water should be one of reverence, not ungratefulness. Water will not always be available in the way it is. It is the essence of life, and without it we would all be pretty screwed. For us, those who populate the American West, perhaps we have lessons to learn from the desert. Lessons of how to be a part of the ecosystem, not apart from it. We need to be cognizant of how our political policies but more importantly cultural behaviors impact this region and the well being of future generations. As Reisner leaves us in Cadillac Desert, “at some point, perhaps within my lifetime, the American West will go back to the future rather than forward to the past.” Wander into the desert. Smell the subtle smell of creosote waft up after a light rain. Appreciate the dire importance of water and the landscape.